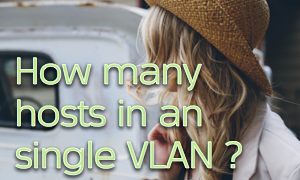 You are here: Home / Blog / How Many Hosts In An VLAN or IP Subnet and Why ? It is common to allocate /24 or /22 subnets to a single VLAN but William writes to ask whether is related to broadcasts. What is the best subnet size for VLAN allocation and why ? The answer isn’t what you think. A CCNP friend of mine says that you should never use any subnet bigger than /22 if all the available addresses will be used due to the broadcast chatter from do many hosts. This sounds reasonable, but I haven’t found anything on the Googles yet to second the opinion (citation needed!). What do you think, is a /22 the largest VLAN you would use in an enterprise? Could you cite any reference on this subject? For 10Megabit Shared Ethernet with some bridges, 100-200 hosts was the rule of thumb. When TCP/IP subnetting came around in early 2000’s we went to /24 because that was a good number of 254 hosts, sat on the classful IP boundary for Class C networking and was roughly the same as existing practices. Networking doesn’t like to adopt change so nothing changed. In the mid-2000’s as TCP/IP took hold it became common to increase the Campus Subnets to /22 as the number of devices in the network increased and we were limited to 1024 VLAN IDs. Networking was forced to make a change, so we did. Broadcasts had reduced significantly because the dominant protocol of Microsoft’s NetBIOS over TCP/IP had stopped using broadcasts for name resolution by default and switched to using Windows Internet Naming Service (WINS) 2. The logic was that 1000 or so hosts would a reasonable number for pure TCP/IP networks. At that time, IP Broadcasts were a problem for performance because Microsoft operating systems on the desktop (of which there was an ever increasing number) would constantly broadcast their name and IP Address so that each computer could build a list of NetBIOS services in the network. For every broadcast received, the network driver in the workstation would directly interrupt the CPU with Non-Maskable Interrupt and process the packet. Many packets are simply discarded because they aren’t needed by every workstation e.g. An ARP request to resolve an IP Address to a MAC Address is processed by every workstation in a VLAN. Back in the old days, it was common to see desktops computers with 5 to 10% of CPU time spent handling broadcasts. Expensive in terms of power and lost processing time. Today, broadcasts are rare because protocols have been updated AND rolled out to operating systems 3. Device operating systems are better hardened against broadcasts storms. CPU speed has increased to the point where even a large amount of broadcasts has zero impact to operation. But I would still use 1000 hosts as maximum because of failure domains. An Ethernet VLAN is, and always will be, a single failure domain because it is a shared medium. A fault on one host may impact every host in the VLAN. Network adapters are much more reliable these days but sometimes network adapters have a silicon failure and transmit corrupted frame onto Ethernet network. These electrical/silicon faults create frames that look like broadcasts and can take down the entire VLAN/Subnet. I’ve seen it happen a couple of times in the last two years. Worst case can take down a Spanning Tree and the entire Ethernet network because broadcasts can cause bridging loops. So, 1000 hosts or /22 would still be my advice but not because there are too many broadcasts but to limit failure domain when bad things happen while having enough IP addresses to support a lot of endpoints like laptops and smartphones. And, FWIW, I would say the same limit (~1000 hosts) is a good Rule of Thumb for a standard IPv6/dual-stack deployment. In the case of dual-stack, this does mean 2 * 1000 protocol instances and respective chattiness to worry about; but for the reasons previously mentioned (better OSes and protocols) it is (IMHO) more about the size of the failure domain than any background chatter on the wire that I would be concerned with. What are common VLAN failures experienced in a Data Center? Unfortunately we don’t get to choose the disaster and those pesky power cords just seem to get in the way. A single VLAN failure would affect 1000 users, however what if the failure was a trunking issue or something that affected multiple VLANs. Would such a possibility alter the size of the recommended failure domain in this case? It is up to you to measure risk. In the data centre I would restrict VLANs to /24 where possible for this reason. The solution, of course, is to implement a L3 ECMP network which limits any L2 failures to the local switch and restricts the size of the failure domain. Agreed. In addition to risk management, tolerance for failure (as you point out) and $$$ weigh heavily on those architectural and infrastructure decisions. “Sometimes network adapters have a silicon failure and transmit corrupted frame onto Ethernet network.” We have had this exact scenario several times, and have been looking for a way to address this at the switch level. Each time this happens, the corrupt frames (which flood the entire vlan at line rate) have a bad ethertype – 0x4000 seems to be the most common. I’ve been thinking that there should be an option to drop frames with an invalid ethertype, but can’t find anything. Any suggestions for how to limit the damage this type of failure can inflict on neighboring devices? Have a lower number of devices per VLAN to reduce the size of failure domain and limit the impact. Nothing else you can do. We’ve had a similar scenario a few times, though I don’t know the ethertype. Amazingly, our 2960 edge switch will flash the port light amber for bad frames, but won’t send a log message or a trap or drop them. Customers must be expected to monitor switches with video cameras! Does anyone make switches that do better? In an Carrier/ISP environment much larger broadcast domains are frequently used, since host to host transmissions are largely restricted. I have seen many CMTSes that use /19’s for CPE addreses. Again a Docsis system is designed to suppress the extra host to host chatter and force things to hit the CMTS before other CPEs see the traffic. Another side note from host side is that most host would have a limited host table size. If my memory serves me correctly, a linux box would have 1024 host entries at most in the table, so 1000 is a good number too. It is possible to tune the kernel parameters to accept more though. Not sure with the other OSs. Good point. I should have thought of that. More IP networks is good for Cisco’s business. I think choosing /24, /23 or /22 doesn’t make much difference. Even though I sort of agree with the conclusion I would like to have seen a theoretical max with acceptable performance goal based on broadcasts or other stats. Reading through the comments its clear that 1000 may not be suitable for some industries like carriers, ISPs. Maybe rather than picking a number like 1000 we should consider using a percentage because even 1000 nodes might be 100% in some places. How does SDN change this? Could the SDN controller respond to ARPs (think ATM ELAN/LANE where the controller is a BUS server) or in other instances reactive flows could be used for forwarding packets to servers based on layer 4 ports (DHCP). This way the network becomes connection-oriented with broadcasts being contained to host-host transmission. We do not need to worry about collisions anymore, but broadcasts (or multicast, for that matter) are still impactful. Also – fault isolation is critical; narrowing both the number of nodes impacted by an outage and the number of nodes’ data you need to (possibly) trace through. Also – Security. Inter-VLAN filtering, or dumping them into VRFs, totally reliant upon starting with separate L2 ‘domains’. While there is no broadcast in IPv6, there is link-scoped multicast (of several flavors) and the term broadcast domain is still a valid one. And yes, we still need VLANs. There are LOTS of reasons to segregate hosts: things like security, fault isolation, network performance, etc. As for the vlan and IP size keep in mind the server virtualization aspect that could affect your planning. There are more vlans due VM sprawl, the same for IP addresses though you may have a small number of vlans the VM sprawl and addresses within the Vlan and within the VM pools can cause some issues with broadcasts. Especial with the virtual switch or a switch FSM not learning properly from a code bug which causes needless flooding and all the VMs are trying to keep up. That is why Greg’s point about the failure domain or shared fate point is critically important especially for VM Vswitchs where you have less visibility into issues. Some companies keep them to /24 /23 just for that reason. I think it totally depends on your IP address that how much subnet and /22 is not the biggest one. I have seen maximum 32 masknet for the IP address!